Nick, Hannah, Dane, Paige, and Max! 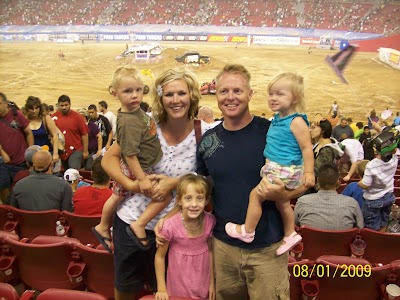 : We Love Monster Trucks! Every year all the Hoopes Boys go to the Monster Truck show--well, a couple weeks ago Dane saw the comercial for it on TV and kept asking when we're gonna go...so we planned a little family weekend in mesa! 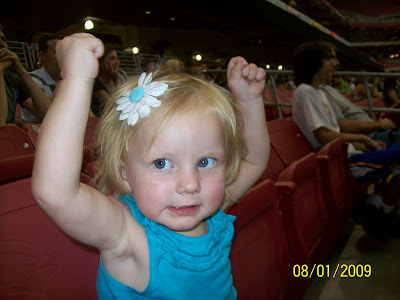 We got to take Nick's little girl, Taylor with us too! She's such a sweet girl and our kids LOVE her! And luckily she loves them too! It was a fun weekend! 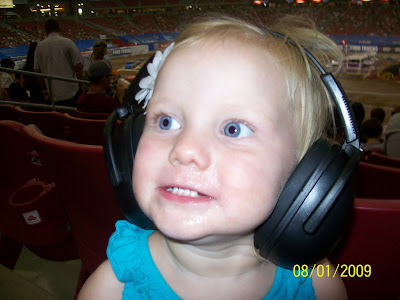 Anyone that says the Monster truck show is loud is underestimating it...it's REALLY LOUD! I didn't realize we should have taken 3 or 4 ear muff things (I forgot what they're called) Paige thought they were pretty cool though! 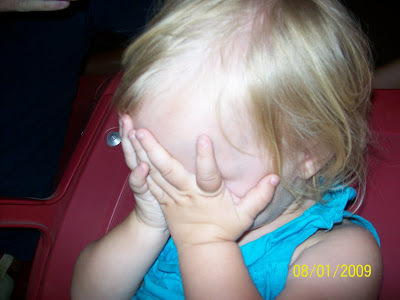 She wasn't for sure she liked it at first--and for some reason, she covered her eyes instead of her ears! And then of course she totally got into like the rest of the "classy" people there and started cheering when the trucks broke a tire or something! 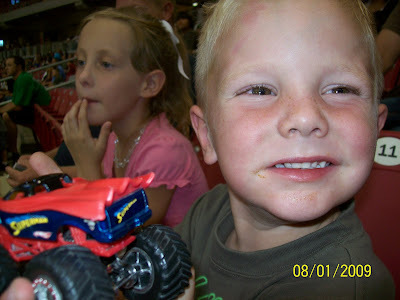 Dane loves anything with monster trucks--the way they sound, the way they look, they way the ramp, anything...this boy LOVES being a boy!